I thought this would happen. 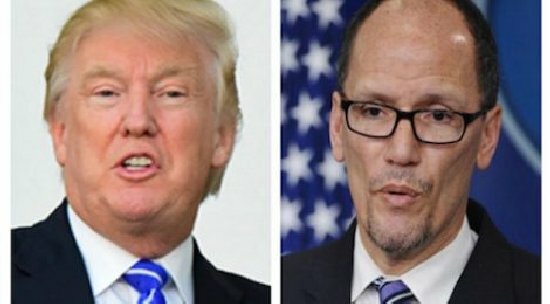 Yesterday, after I wrote about Tom Perez beating Keith Ellison to become DNC chair, I saw President Trump tweet out: “Congratulations to Thomas Perez, who has just been named Chairman of the DNC. I could not be happier for him, or for the Republican Party!” That was a nice jab… indicating that the GOP would have a field day taking Perez apart. But Perez appointed Ellison as Deputy DNC Chair and feels that doubles their strength against Trump. So, the crazy will double down now in the party and they will shift even more to the left. When Perez talks about them being Trump’s worst nightmare, I assume he is referring to riots, protests and chaos in the streets. Nice threat there bud. Perez is the face of Obama and Clinton… Ellison is Sander’s boy. Perez is a communist and Ellison is a Marxist Muslim radical. There will definitely be a dance to be had here with these moonbats. President Trump managed to get a rise out of the new Democratic National Committee chairman Saturday. Shortly after Democratic National Committee members elected Tom Perez, who was labor secretary under former President Barack Obama, Trump tweeted his congratulations and approval. Perez, who was considered the establishment Democratic candidate for the position over far-left rival Rep. Keith Ellison, managed to squeak past his primary opponent in a 235-200 vote of the committee’s 435 members who cast their ballots. Trump’s statement that he was pleased for the Perez victory on behalf of the Republican Party is no doubt in reference to the president’s victory over Hillary Clinton — an establishment Democrat. Perez was elected on the second round of voting — he was one vote shy of victory after the first round. His statement that both he and Ellison will be the GOP’s “worst nightmare” referred to the Minnesota congressman’s election as the party’s deputy chair. Tom Perez supports Islamic Sharia Law in America which is antithetical to the U.S. Constitution and the Bill of Rights. Perez had his own Hillary Clinton-like email scandal, secretly using a private email account to do government business while at the Department of Labor. Perez “likely violated both the spirit and letter of the Federal Records Act” by using his private email to hide what he was doing from federal officials, according to The Wall Street Journal. Tom Perez radically supports amnesty for illegal aliens and is anti-border enforcement. “Bringing 11 million undocumented workers out of the shadows and on a path to citizenship will give them access to higher wages and greater economic opportunity,” he said on October 29, 2013. In 2012, while at the Obama Justice Department before becoming labor secretary in 2013, Perez sued Jacksonville, Florida, because black firefighter applicants got lower test scores on exams than white applicants. Perez believes that written tests for firefighters and police officers is somehow discriminatory. Perez had the radical view that the DOJ’s Civil Rights Division’s mission was to help those “living in the shadows” (helping illegal aliens). Perez believes that applicants to certain professions should be given preference based on skin colors other than white. Perez is a big proponent of foreigners in America illegally receiving in-state tuition discounts. A lifelong bureaucrat, Tom Perez was deputy assistant attorney general for civil rights under Democrat president and serial woman abuser Bill Clinton. Perez worked under nutjob Janet Reno. Perez is a proponent of “Critical Legal Studies,” which is a legal theory derived from anti-American Marxism. Perez was elected on the second round of voting. He was one vote shy of victory after the first round. The final tally was 235 to 200. He didn’t beat Ellison by much. This dynamic duo will go to war with President Trump and the right. But in the battle of Tweets, much like everything else, Trump always wins.